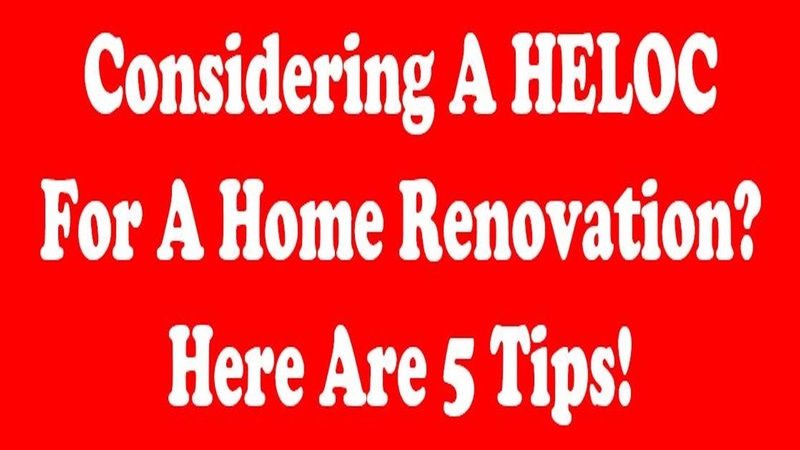 Considering A HELOC For A Home Renovation? 5 Tips! Homeowners looking to undertake home renovations can often use a home equity line of credit or HELOC to finance their projects. Comparison shop to get the best rate. Most people just go with there current mortgage company but this may not be the best option. See what other companies are offering, it may save you money! 2. Ask about the margin. If you're offered a rate that's lower than the competition, it's probably just an introductory rate, so ask about the lender's margin. For example, if the introductory rate is 3.5 percent and your lender's margin is 2 percent, your final interest rate will be 5.5 percent. 3. Consider a conversion clause. Some HELOCs allow you to convert a variable interest rate to a fixed rate, usually during the draw period (5-10 years). 4. Watch out for balloon payments. Balloon payments mean that you must pay the balance in full when the draw period is up. Do not choose this option unless you have the financial means to handle it. 5. Create a family plan. Decide what the money will be used for and who will handle the funds. Keep in mind, you can lose your home if the HELOC is not handled properly. Create a payback plan. Come up with a reasonable plan for how the loan will be paid back. He will be happy to provide you with some FREE information!